The track opened in September, 1973 under the direction of Lee Berwick. Berwick was primarily looking for a recognized facility to run Quarter Horses, having earlier held races on his farm in St. Joseph, Louisiana. Delta Downs in Vinton would hold both Quarter Horse and Thoroughbred race meetings, some years in a mixed format. In the 1990s, the track was bought by developer Shawn Scott for $10 million. Shortly thereafter, it was sold for over $100 million to Boyd Gaming after a law was passed allowing for slot machines at Delta Downs. After the purchase, Boyd Gaming made over $120 million in capital improvements. The casino, hotel and track were badly damaged by Hurricane Rita in 2005; the casino and hotel were partially opened two months later. The track was closed for about six months after the hurricane. Fueled by revenue from the slots casino, the quality of racing at Delta Downs has improved. The winter Thoroughbred meeting has produced several stakes-quality horses in recent years. The track is a 6 furlongs (1.2 km) oval. There is a 550 yards (0.50 km) Quarter-Horse chute, in addition to a five-furlong (1km) and 1 1/16-mile Thoroughbred chute. The track surface is a mixture of sand (from the Sabine River) and clay, with a limestone base. The track has stabling for 1200 horses. The Delta Downs grounds features horse pastures which are visible from the entrance. Draft and miniature horses and Thoroughbreds are on display. The Quarter Horse Red River Rebel, owned by Malcom Chiasson, holds the track record as of 2011; he is also the leading money-winning Quarter Horse in Louisiana. The casino has more than 1,600 slot machines; the racino has only slots, due to restrictions in state law. The hotel has 203 rooms, with 36 suites. 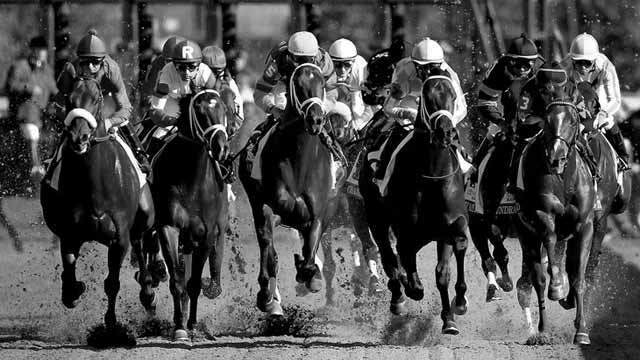 The track usually holds races from November to mid-July, with the Thoroughbred meet beginning in November and the Quarter Horse meet commencing in April. Delta Downs hosts the Grade III, $750,000 Delta Jackpot Stakes for 2-year-olds. The other major stakes is the Grade III, $500,000 Delta Princess Stakes for 2-year-old fillies. Home of the winners: Kentucky has produced seven winners of the race while two where bred in Florida and one in California. Connections: There have been no jockeys, trainers or owners that have won the race more than once. Where they started: Post positions 4 and 8 are the only ones to produce multiple winners of the race as two winners have come from each. The only post positions that have not produced a winner are 2 and 10. Early speed: The 2006 edition of the race produced the fastest fractions of the races as Go Poppa Fooze blazed through the opening ¼-mile in 22.10 seconds and the ½-mile in 45.00. The quickest ¾-mile time also happened that year as Malt Magic stopped the timer in 1:11.20. Final time: The fastest final times of the race happened in 2002 and 2008. In 2002 the race was contested at one mile and the winner, Outta Here, finished the race in a time of 1:37.77. Every other running of the race has been at 1-1/16 miles and the fastest time at that distance belongs to Big Drama, who was clocked in 1:44.72. Margins of victory: The largest margin of victory in the race belongs to 2011 winner Sabercat, who hit the finish line four lengths in front of runner-up Basmati. The smallest margin occurred in 2007 when dead heat winner's Turf War and Z Humor finished a neck in front of third-place finisher Golden Yank. What they paid: The highest Win payout came in 2010 when Gourmet Dinner was sent off at 20-1 and returned $42. The lowest Win payout occurred in 2007 when co-champion Z Humor produced a price of just $2.60. Mutuel Handle: Jackpot Day continues to set records for Delta Downs as the event matures and will celebrate its 10th anniversary this fall. Last year's program produced an overall handle of $4,434,099 and the race itself took in $1,306,435 in wagers alone. Both of those numbers were all-time records for track which is now in its 40th year of existence. 550-yard (QH) 1 1/16-mile (TB) chute, 5-furlong chute. Distance from last turn to finish line: 660 feet. The track surface is a mixture of sand (from the Sabine river) and clay with a limestone base.